Over the last many years Manick Sorcar's art exhibitions were held at different art galleries in Colorado, including the historic Foothills Art Center in Golden, Jefferson County Libraries in Arvada and Lakewood, 'Odyssey 2008: Share the Journey' at Omni Interlocken Resort in Broomfield, and a series of them as a part of the yearly 'Arvada Art Studio Tour' . His art work was also exhibitted and auctioned at the fund raising campaign for the KRMA-TV, Channel Six, as well as by the TNT North Metro Training Team for Leukemia and Lymphoma Society. He had to miss exhibiting his art for the last few years because of laser show commitments that took him at various cities in the USA and abroad. This year he intends to hold the art exhibition with the 'Arvada Art Studio Tour' in September 2018, at his 2,800 s.f. art gallery at 14565 West 58th Place, Arvada, Colorado, which will be open to public. The theme is "Ajanta"; exact dates and time will be announced later. Ajanta caves are rock-cut Buddhist cave monuments the date of which start from the 2nd century BCE to about 480 CE in Aurangabad district of Maharashtra State, India. 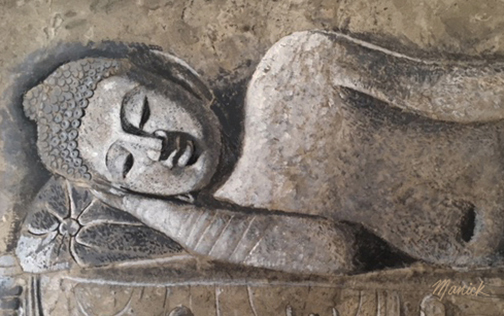 They include paintings and rock-cut sculptures of the finest surviving examples of ancient indian art, expressing emotion through gesture, pose and form. The site is a protected monument in the care of the Archaeological Survey of India and since 1893, a UNESCO World Heritage Site. Manick's art exhibition will display several of those unique cave arts through his paintings on Indian slates and hard tiles, such as the sample above and more. Watch for further announcements.